While looking through FlyPast magazines for 1999 I came across a request for info in the 'Help' section. The request was from a Mr. Peter V. Richards from Bourne, Linc's. "ADEN and RADFAN in 1963-1967 - author looking for personal photos of resident squadrons and visiting aircraft at RAF Khormaksar. Also interested in all aspects of Aden (down town) and the Radfan War(up country) - RAF, Navy, Army and family experiences. 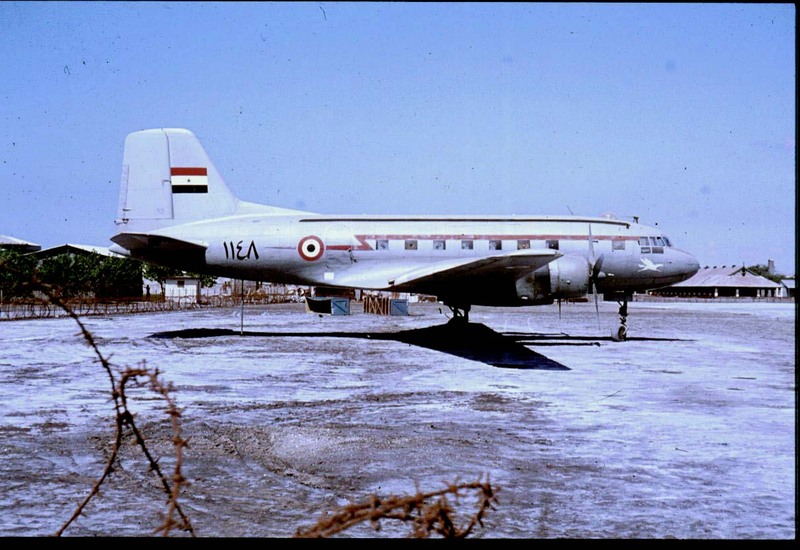 In addition, require photo of the Egyptian/Soviet Ilyushin Il-6 parked outside ASF(jets) at Khormaksar from Nov 1963 to Aug 1964, or picture of it taking off for Egypt with RAF crew". I have no idea if the last reference to the RAF crew is for Royal Air Force or Russian Air Force ? But suspect the the contributor meant Royal Air Force crew. Has anyone any knowledge of this event and was it flown to Egypt by one of our crews . If so was this a one off event or did our crews fly other Soviet aircraft ? Captured on 2 December 1963, by British Army Captain by blocking the runway after aircraft landed at a remote WAP airfield (Lawdar) by mistake. Flown on to Khormaksar by team from Boscombe Down.